Fragments is an event―an unforgettable book that will redefine one of the greatest icons of the twentieth century and that, nearly fifty years after her death, will definitively reveal Marilyn Monroe's humanity. Marilyn's image is so universal that we can't help but believe we know all there is to know of her. Every word and gesture made headlines and garnered controversy. Her serious gifts as an actor were sometimes eclipsed by her notoriety―and by the way the camera fell helplessly in love with her. Beyond the headlines―and the too-familiar stories of heartbreak and desolation―was a woman far more curious, searching, witty, and hopeful than the one the world got to know. Now, for the first time, readers can meet the private Marilyn and understand her in a way we never have before. 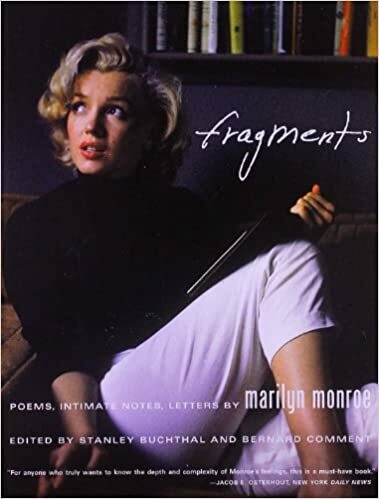 Fragments is an unprecedented collection of written artifacts―notes to herself, letters, even poems―in Marilyn's own handwriting, never before published, along with rarely seen intimate photos. Jotted in notebooks, typed on paper, or written on hotel letterhead, these texts reveal a woman who loved deeply and strove to perfect her craft. They show a Marilyn Monroe unsparing in her analysis of her own life, but also playful, funny, and impossibly charming. The easy grace and deceptive lightness that made her performances indelible emerge on the page, as does the simmering tragedy that made her last appearances so affecting.